Hi Friends! How is it possible that Thanksgiving is in 3 days? What happened to October? So, we’re getting in right under the wire with a couple of new recipes like Cranberry Port Sauce that you should seriously consider adding to your Thanksgiving table. As you know from previous Thanksgiving posts, I have a thing about cranberries (I love them!) 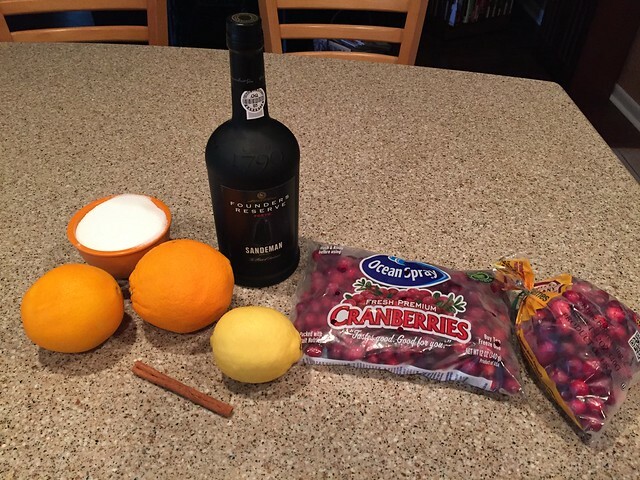 and especially cranberries enhanced by a little booze. Remember the Drunken Cranberries from a few years ago? 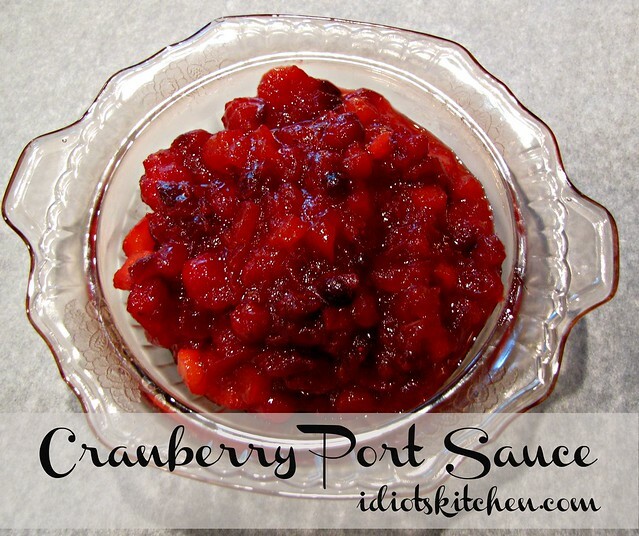 While I still love those, this Cranberry Port Sauce has quickly become my go to cranberry recipe for Thanksgiving. It’s quick, easy, and super tasty. As a bonus, you can make it a few days ahead and it will only be better by turkey day. If you’re not a port drinker, you want to look for Ruby Port in the wine section. Port is a fortified wine (like Sherry, Marsala, and Madeira) and can be used for cooking or for sipping. It’s worthwhile to buy a little better bottle of port here since it is one of only a few ingredients. There are bottles of port that are about $5 and they taste like a $5 bottle of wine. Not good. This bottle was about $15 but it’s good enough to drink. You know how I feel about cooking wine…just say no. 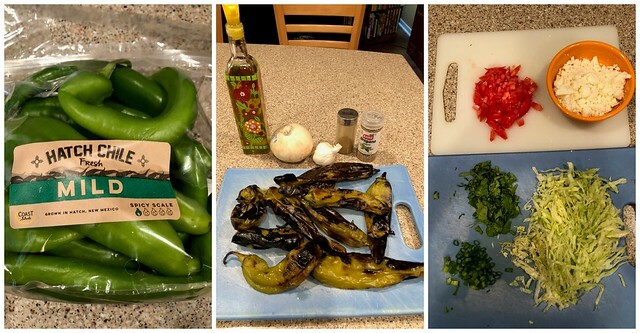 Hatch Chile Season has come and almost gone so I thought I’d better get back to Idiot’s Kitchen to evangelize about these awesome, seasonal peppers. 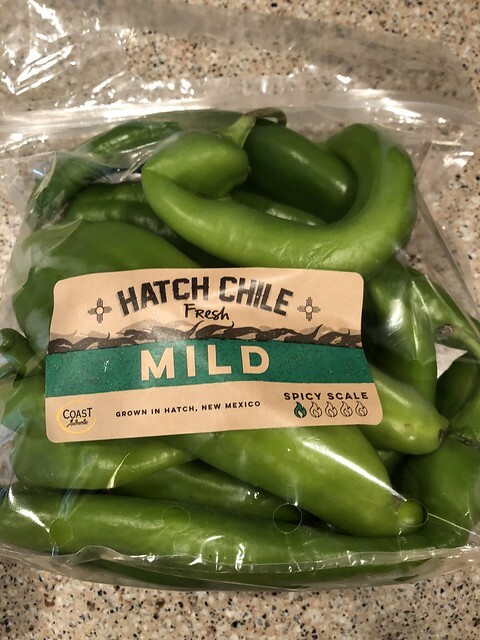 In case you’ve never had or heard of them, Hatch Chiles are a green chile pepper grown in the Hatch Valley in New Mexico. Similar in size and shape to an Anaheim or Cubanelle pepper, they are known for their mild heat and distinctive, slightly smoky flavor. They are a seasonal pepper and are found in stores mid-August through September. Lucky for me, a couple of the grocery stores by my house have gotten on the Hatch Pepper bandwagon so I can get these babies from New Mexico (where people go crazy for them…have festivals, etc.) all the way over to Florida. Hooray! I bought some last year and made enchiladas and when I went back to get more they were all gone. I didn’t make that mistake this year so over the course of the past few weeks, we’ve had about 6-8 pounds of Hatch Chiles go through the kitchen. 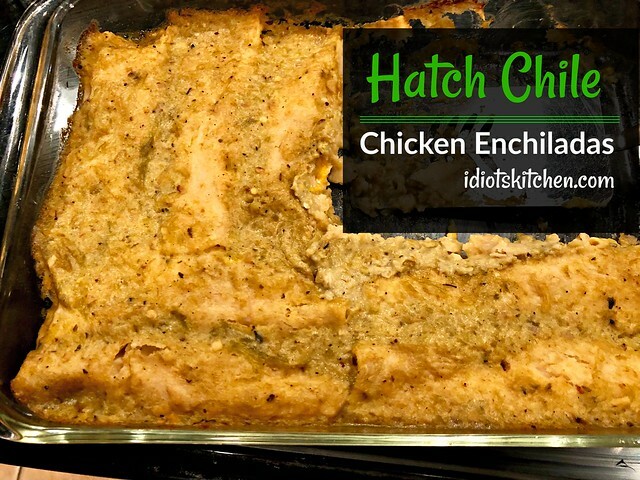 I’ve made Hatch Chile Burgers, Hatch Chile Chicken Chili, Roasted Chiles for freezing, and these awesome Hatch Chile Chicken Enchiladas. Not to worry though if you can’t find official Hatch Chiles. This recipe is a good, general green chile sauce and can be made with any combination of Anaheims, Poblanos, and/or Cubanelle peppers. I hope you will permit me a moment of remembrance for a dear friend to me and to Idiot’s Kitchen. My friend Cody Stanford passed away unexpectedly last week and I feel that it would be remiss of me not to mention him here as he was a huge influence and cheerleader for my starting Idiot’s Kitchen from day one. 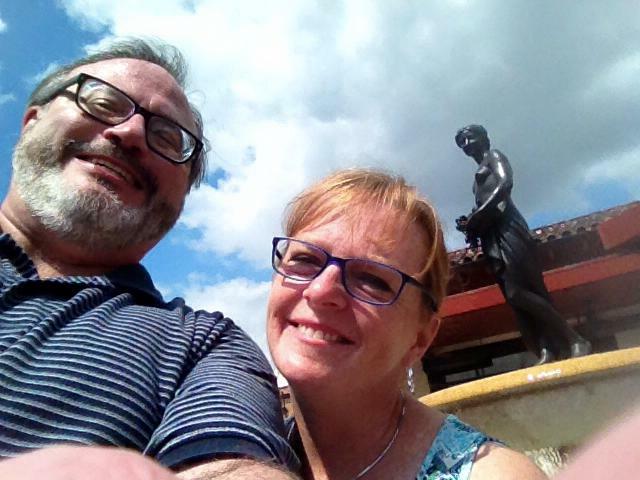 Cody and I met over 30 years ago (ahem) when we were the classical music nerd employees at Pennylane Records in Kansas City. That little record store came with a cast of characters that still fuels plenty of good stories today. This was back in the day when you played actual records in record stores so when we were tasked with closing, we would crank up the tunes…not Bach and Beethoven but Dexter Gordon, Mark Knopfler, Warren Zevon, or Joe Jackson. After we both moved on from the store, somehow we managed to stay in touch and a true friendship developed from our love of music to our love of cooking and more. Every Christmas Eve for more than 25 years we would meet at Andre’s Restaurant just south of the Plaza, have lunch (always with Scott as our friendly server) and exchange gifts. More often than not, we would exchange the same cookbook for Christmas. I know that was the case with Marcella Hazan’s Essentials of Classic Italian Cooking and shortly after the holiday, Cody invited me over to have Pork Chops with Tomatoes and Sage and an amazing beef flavored risotto. It’s no accident that Pork Chops with Tomatoes and Sage was the first recipe featured here at Idiot’s Kitchen. For the 8 years that Idiot’s Kitchen has been up and running, Cody has called, texted, or emailed me with recipes to feature on the site. “You HAVE to make this!” he would write. “This is PERFECT for Idiot’s Kitchen!” He loved cooking, adored Julia Child, and took copious notes in his cookbooks for each iteration of a recipe. Off the top of my head, I know that some of my favorite recipes like Maple Glazed Pork Chops, Chicken Provencal, Chicken Diabolo, Pork Chops with Sherry Vinegar, the most awesome baked Corned Beef with Mustard, those famous Pork Chops with Tomatoes & Sage, Shrimp Linguini, and more came as “suggestions” from Cody. In fact, I have a whole file on my email of recipes I haven’t had a chance to make yet but are Cody Approved. 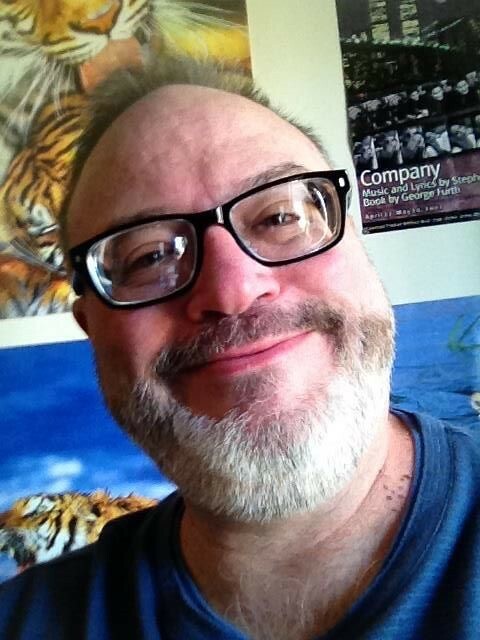 Cody was a gifted writer and had published several novels with a specialty for Young Adult Fiction. 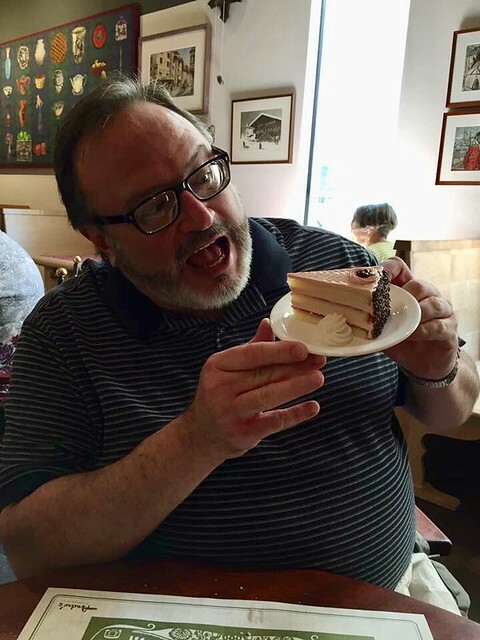 He loved art and adored going to the Nelson Gallery in Kansas City…usually followed by a trip to Andre’s where he would send me cell phone photos of his desserts. (Give me all the rum balls…gluten be damned!) He adored opera, owned a conductor’s baton (something for which I had to forgive him) and would wear headphones, blast Renee Fleming at her best, and conduct along. He loved good movies (not just ones with Robert Redford although Three Days of the Condor was a favorite we shared) and enjoyed everything from animated movies to foreign films. Fanny & Alexander was his favorite. Unless his favorite was something by Woody Allen. Or unless his favorite was the animated Rescuers Down Under. He loved tigers and used to be a volunteer at Cedar Cove Feline (and Wolf) Sanctuary in Louisburg, just outside of Kansas City. When I would visit, he would give me the insider’s tour so I could commune with the big cats and especially whistle with my buddy Tom the panther. At least once a week he would post a photo of Robert Redford, Paul Newman, Sean Connery, Hugh Jackman, et al to my facebook page with a “Good morning, Claudia!” or “Cheers, Claudia” message. And usually then also include a recipe. In my stress over being largely absent from the website this year, every time I thought about pulling the plug, Cody would encourage me, and urge me to keep going. “Just write about what you do every day,” he would say. There’s a lesson there that I will be taking forward. So, tonight I raise a glass of the good bourbon to my dear friend Cody. Cheers to you, my friend. xo – with love and deepest sympathy to his family – especially his sister, Melinda. 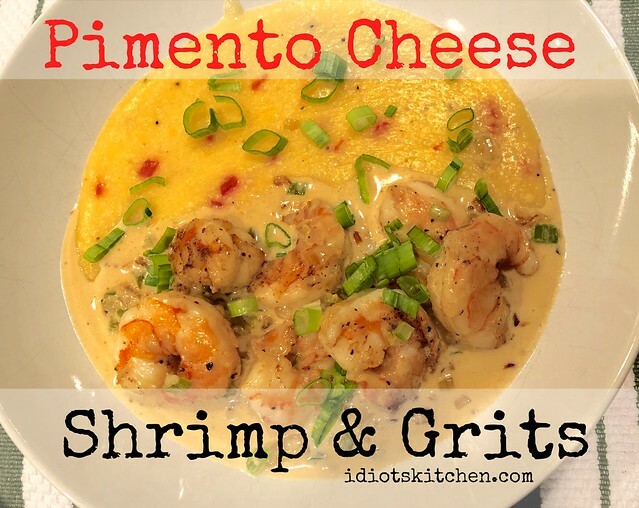 Oh boy…I knew I loved Shrimp & Grits but didn’t know how much I loved it until I made Pimento Cheese Shrimp & Grits! Please tell me you eat Pimento Cheese! I know it’s an old-timey Southern thing, but it’s easily one of my favorite things to put on a sandwich…probably tied with the BLT for my favorite. And we all know that Cheese Grits are a staple of any good cook’s repertoire so why not combine the two? Another big positive for this dish is that it comes together very quickly. You can have this on the table in under 30 minutes with time to spare. More time to make yourself some sort of bourbon-laced cocktail! *Yes, a lot of ingredients didn’t make it into the ingredient photo. The pictures, or lack thereof are not great for this one but as you know, it’s been a while since I’ve been here at Idiot’s Kitchen so I didn’t want to wait for better pictures. We have Pimento Cheese Shrimp & Grits to eat and no time to waste. Plus this is an easy one…we’ve got this. Here we go…do a little prep work. 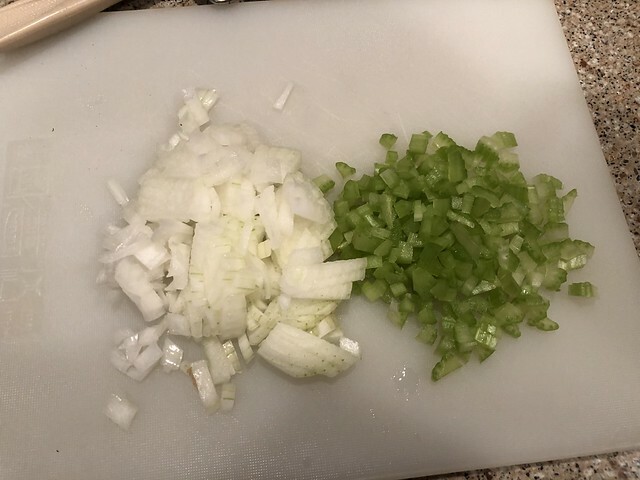 Finely chop 1/2 a small onion, about 1/2 cup, and 1 stalk of celery. Hello Friends! 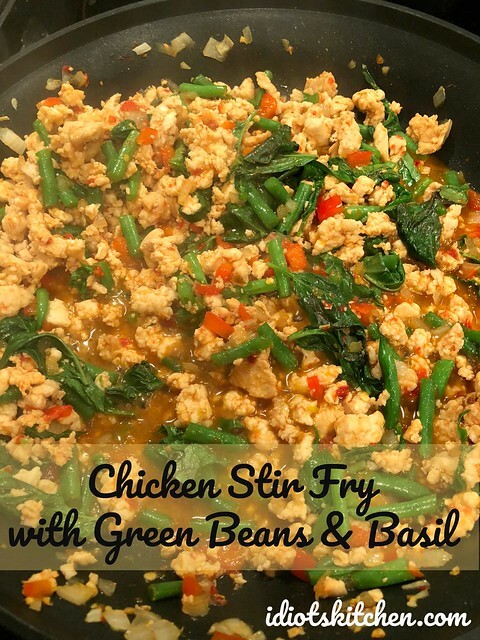 I’m hoping to make up for yet another long absence by giving you a recipe that you will love to make again and again…Chicken Stir Fry with Green Beans & Basil! This is another winner of a recipe that my friend Nikolay made for me after an orchestra rehearsal. He and Colleen are gracious to host me occasionally which saves me from the big old boring drive and has the added benefit of getting to dine on Nikolay’s fine cooking. Right when he started cooking this one, I knew I had to have the recipe. It has simple ingredients combined to make an incredibly tasty and easy dinner. Plus, you get to hone your Iron Chef chopping skills! Prepare 2 cups of rice in advance of cooking. 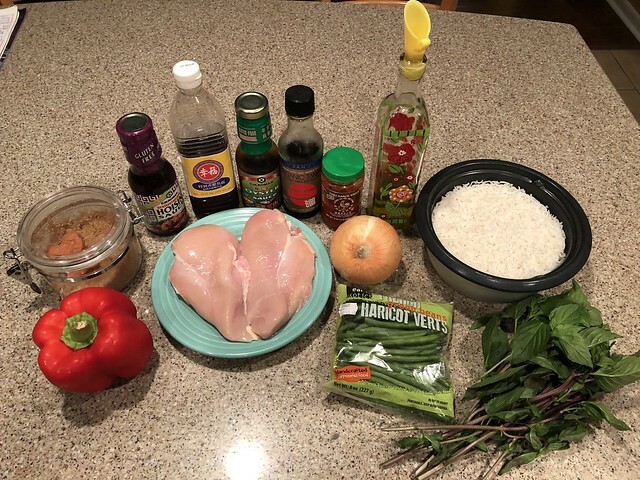 In the past, I’ve used regular long grain white or brown rice, basmati, or jasmine. For 2 cups of rice I cook 1 cup of dry rice in 2 cups of water in my rice cooker. You can do this in advance and reheat it if you are in a hurry. 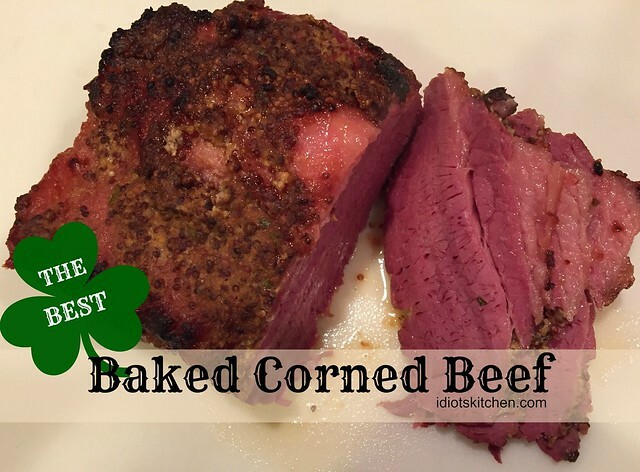 St. Patrick’s Day is tomorrow so I’m getting in just under the wire to share the recipe again for THE BEST CORNED BEEF! It’s baked, not boiled, and has an amazing, zingy mustard crust. This is what I’ll be having on Sunday – opera performance tomorrow so no shenanigans for me. Really, you must try it. It’s so tender and not stringy and super salty like deli corned beef. 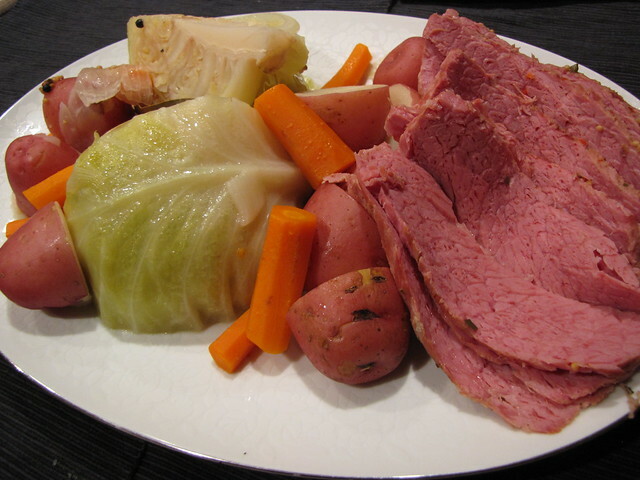 If you’re a traditionalist, and want the good old Irish Boiled Dinner, we can do that too. 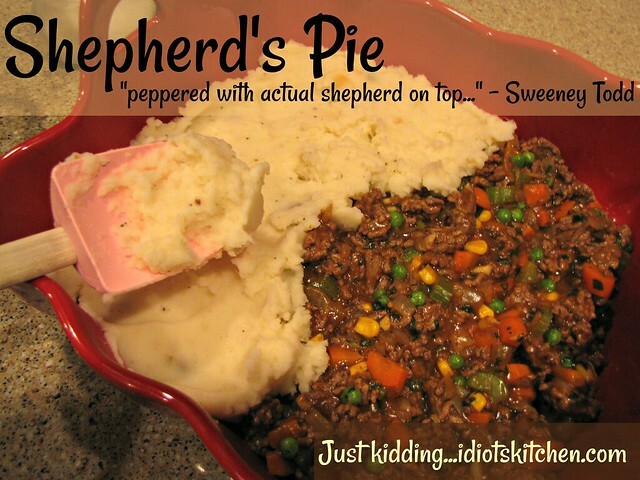 Or, if you’re not a fan of corned beef, why not try this delectable Shepherd’s Pie? Of course, it’s mandatory that you sing songs from Sweeney Todd while you cook the Shepherd’s Pie. Go forth and celebrate with some good food and good friends. 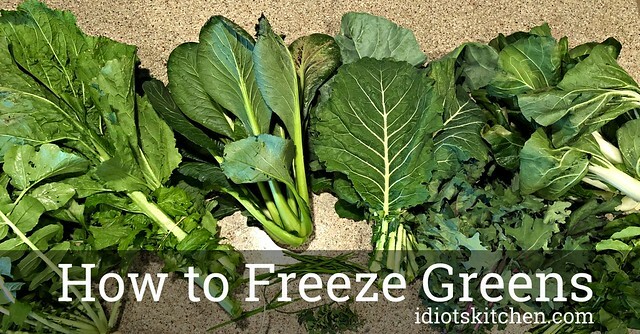 How to Freeze Greens! Those deep, dark, vitamin filled greens! In my last few posts, I’ve mentioned that I’ve joined a CSA (Community Supported Agriculture) this year so I’ve been receiving farm fresh, organic vegetables every other week for the past few months. For everyone else, this is a summer gardening thing but here in Florida prime farm and garden season is underway right now. A staple of the CSA haul, especially for the first month or so, has been a variety of dark leafy greens. I’ve received huge bundles of mustard greens, collard greens, kale, and a few funky varieties of Asian spinach. My goal is to not waste or throw away anything from my CSA boxes…and so far, so good! 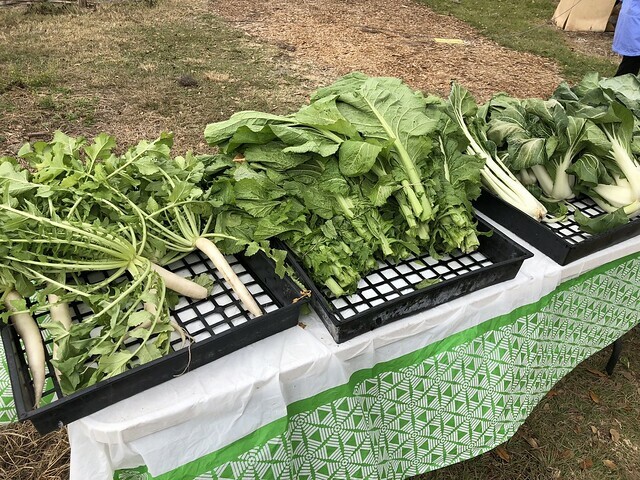 However, sometimes the greens schedule and the flute playing/travel schedule do not align so I had to quickly learn how to deal with big bunches of greens and figure out a way to save them for a later date. Fortunately, it’s very simple to process and freeze any hearty, thick greens like mustard, collards, Swiss chard, and kale. More tender, water filled greens like lettuce and bok choy are better kept in the refrigerator as they will turn to mush when frozen. 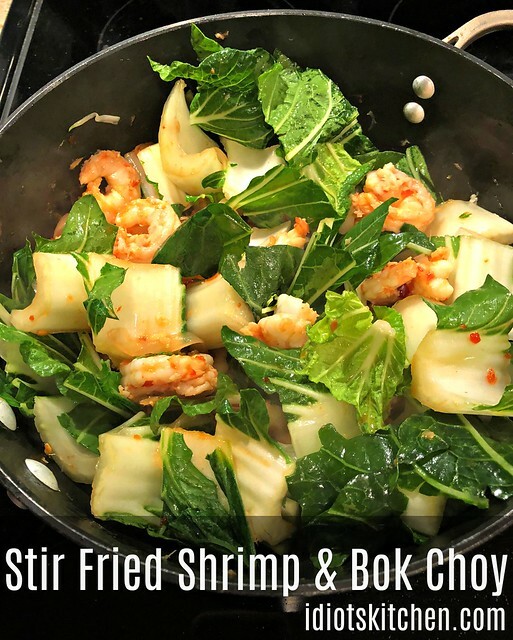 Stir Fried Shrimp & Bok Choy has quickly become a new favorite at our house. 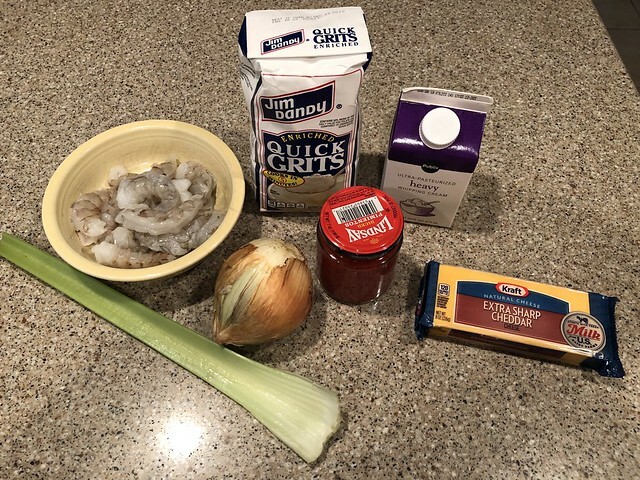 The shrimp part is a no brainer – we love it and I always have good, flash frozen, wild-caught pink shrimp in my freezer. One of the perks of living in Florida is easy access to good shrimp. 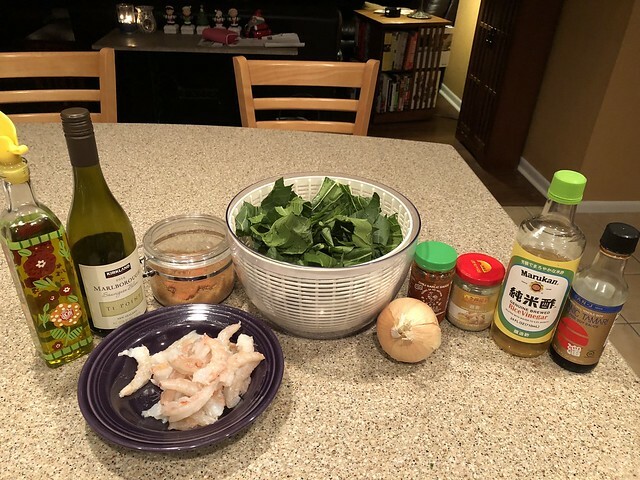 The bok choy part was an easy addition. I often buy baby bok choy and sauté it as a super quick side dish. However, this year I’ve joined a CSA for the first time. For those who don’t know, CSA stands for Community Supported Agriculture. It’s basically signing up with a real life farm (and farmer! ), paying a fee, and receiving fresh produce on a weekly basis. Because Florida weather is all upside down and sideways, our CSA farming season happens in what everyone else calls winter. 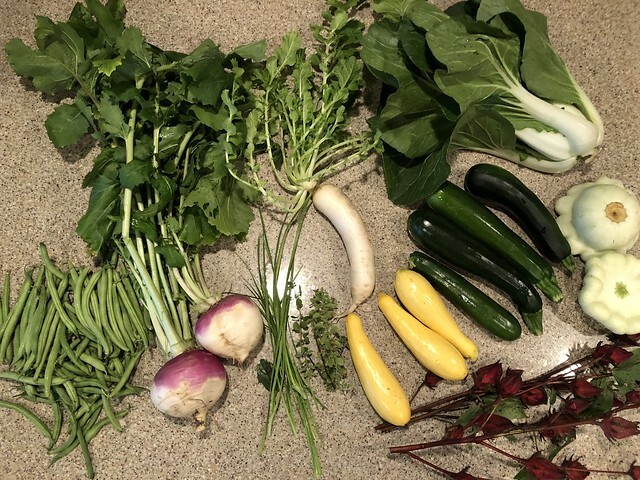 Every other week (I bought a half CSA share because there are only two of us) I go out to the farm, which is only about 15 minutes from our house, and pick up whatever fresh veggies they are offering. Look at all these gorgeous, organic veggies! I’m in heaven!!! This is a picture of my first haul from the farm. Left to right we have Green Beans, Turnips, Garlic Chives, Oregano, Daikon Radish (that’s the long skinny white thing…delicious! ), Yellow Summer Squash, Zucchini, Bok Choy, Patty Pan Squash (I stuffed those! Recipe coming soon.) and Roselle which is also called Florida Cranberry. It’s related to a hibiscus so I made tea with it. So far, I’m really happy that we haven’t wasted anything we’ve received. This also speaks VOLUMES for the quality of real, fresh from the farm, organic produce. I’ve kept some of these things in my fridge for well over a week (in fact, this bok choy is a good example) and nothing has wilted or gone bad. Can’t say that about any of the produce from the regular grocery store. So far I’ve received 3 big heads of bok choy so this recipe was born of necessity. Also not pictured is rice, which I suggest for serving. Start that first as it takes 20 minutes and this recipe cooks in half that time. 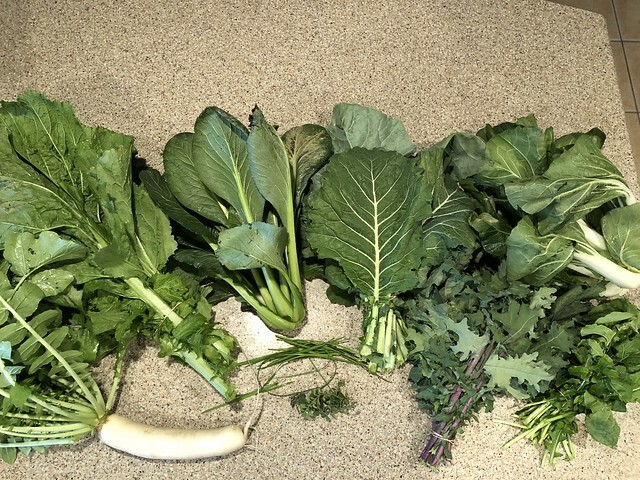 Another Daikon Radish (I’m making a salad with one of those tonight), Mustard Greens, Chinese Spinach, Collard Greens, Kale, another Bok Choy, and my favorite….Arugula!!!! Happy New Year, Friends! I hope 2018 is starting off easily and peacefully for everyone. 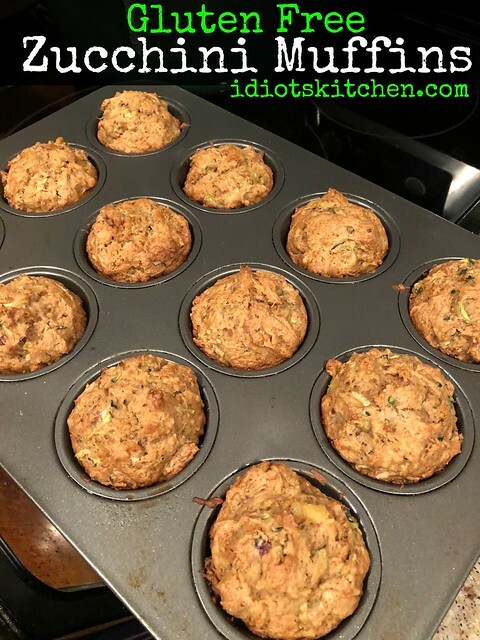 I thought I would start the year off by sharing this easy recipe for Zucchini Muffins. It was my first real victory in gluten free baking…which is saying something since I’ve been gluten free for 4 years. Obviously if you’re not gluten free (you lucky pizza eaters!) you can make these with regular old all-purpose flour and they will be just as good. In fact, I’m making a regular batch as soon as I post this. But the secret to finally achieving some small measure of gluten free baking success is finally finding a good GF flour blend that I like. I have lots of books on GF baking but let’s be honest, I’ve been too busy to cook and post recipes so I’m pretty sure that means that I am way too busy to buy, weigh, measure, and concoct my own GF flour blend. 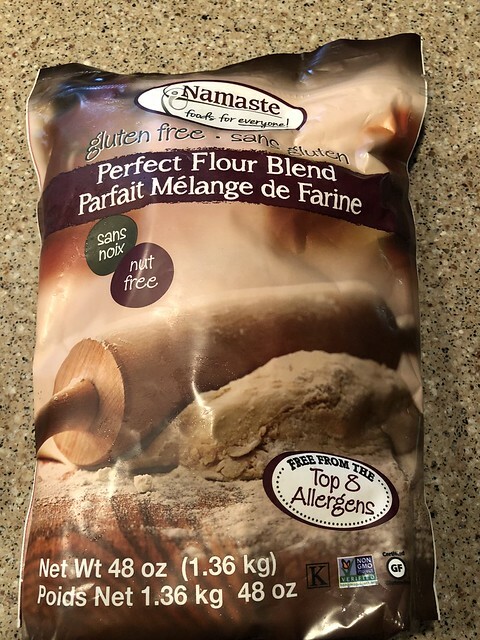 Enter Namaste Gluten Free Flour! (And no, this is not a sponsored post, I’m just sharing the love.) On the advice of my friend Jen, I started searching for this at my Costco. They also sell it at Amazon and I’ve seen their baking mixes in some of the higher end grocery stores like Fresh Market and Whole Foods. My Costco doesn’t sell it yet (I keep begging) but I was able to buy it from Costco online…the kicker was I had to order a whole case! Good grief. Oh well, it’s happily living in my freezer. Friends…we need Smell-O-Vision in a big way for this recipe! Trust me when I tell you that you do not want to miss this one. 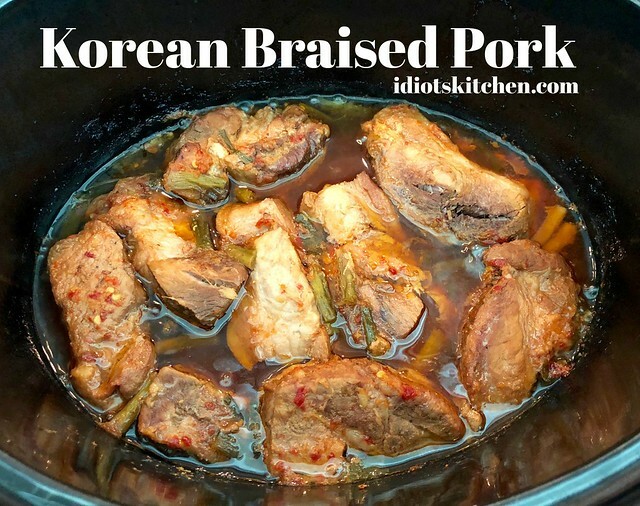 Korean Braised Pork could not be easier, more tender, tastier — dig out your crock pot/slow cooker and this one practically cooks itself! And options! We have many delicious options for serving this from rice bowls to tacos to eating it right out of the pot. My friend Jen made me a version of this recipe for one of our famous carpool dinners. 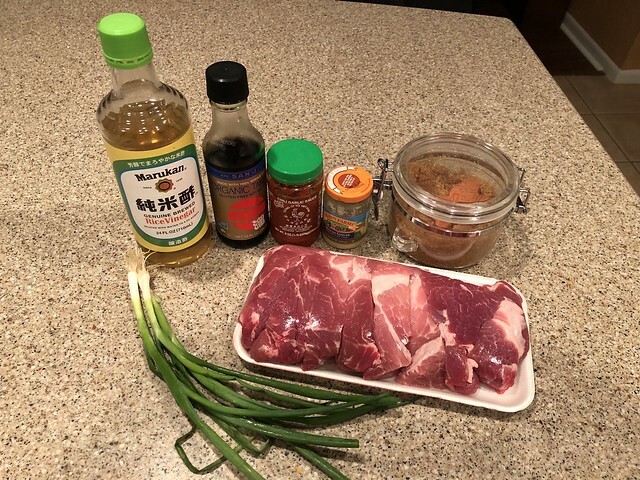 Yeah, imagine that you’re expecting to eat fast food in the car and your best friend brings you a warm rice bowl full of slowly marinated tender pork. That’s a friend worth keeping! 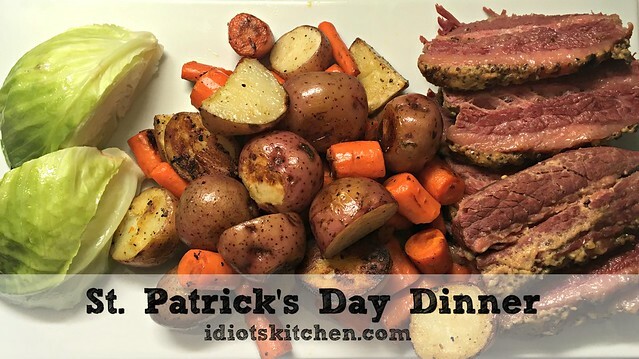 As with most of my crock pot cooking, this is a Dump & Run Recipe – no pre-cooking or browning the meat – just dump it all in there, set the crock pot, and go about your day.